Does Onychomycosis Laser Treatment Work? In 2012, a team of researchers in Alberta reviewed all existing literature regarding the efficiency of laser onychomycosis treatment and concluded that laser treatment for fungus nails is the most effective treatment available. The authors noted that one clinical study showed a 100 percent clearance rate in 42 nails over the course of 12 months, without any side-effects. Another study that looked at patients of varying severity found that 85 percent showed improvement after four rounds of treatment over six months. Given all the pros of using lasers to cure toenail fungus fast, it’s an obvious choice for many patients. Talking to the NY Times, Dr. Boni E. Elewski reports that nail infections “can lead to serious health problems among people with diabetes and immune disorders.” So, if you are in one of these categories, seeking treatment should be a paramount concern. Likewise, if unsightly fungus nails are putting a damper on your social life, then laser treatment makes sense here as well. However, you must also be in a financial position to afford the treatment and fully committed to preventing its recurrence. Spending a couple hundred or a thousand dollars on a single procedure is nothing to scoff at, but you will need to do your best to limit your exposure to fungi in the future. You’ll need to change wet socks, wear sandals or shower shoes in public places, and clean your shoes with UV light daily for any measure of true success. I have been dispensing (and personally using) SteriShoe for over 4 years now. It is a great adjunct to laser treatment for toenail fungus. Thanks for giving nice information regarding onychomycosis laser treatment. It would be more helpful if it contains treatment tips. I am a Denver Podiatrist , I have been treating nail fungus in my office for more than 15 years, It can be very frustrating and difficult to eradicate. People come in to my office all the time with stories of one thing or another, the bottom line is, there are only 2 things that work, oral medication (Lamisil or Spornox) and laser treatments. Oral medication has all its inherent risks and limitations. Oral medication can affect the liver, taste, the gut and people should not drink while taking these medications. If there are circulation issues this may affect the ability of the medication to reach the toes limiting its effectiveness. Oral medication is anywhere from 45-70% effective depending on the research. 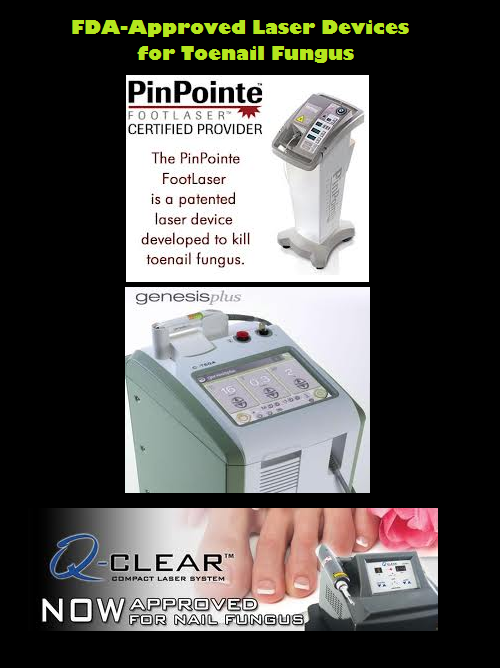 Laser Nail Fungus Treatments are 50 to 80% effective. There are no side effects, the treatments are fast, relatively painless, and there is no down time. It has been my experience after using all FDA approved treatments the most effective treatment is a combination of low dose Lamisil (oral medication) and laser treatments. We have been treating patients like this for almost a year and our results are 90 to 95% effective. We should be ready for publication next year sometime. Topical treatments are really not used much as a first line treatment against nail fungus anymore. Years ago Penlac became available in the US with 50 – 80% success rate. In reality it was more like 5-8% success rate and only with mild superficial cases. We use them today as part of our long term prevention plans. It is important everyone understands some people are more prone to these infections than others. Genetics, circulation issues, medications, medical conditions, environmental factors, and other factors put people at an increased risk of developing and redeveloping this infection. When we evaluate our patients, we take a detailed history and address all factors, this allows us to customize a long term plan aimed at minimizing the risk of reinfection for each patient. Thanks for sharing your expertise! Get in touch with us if you’d like a uv shoe sanitizer for your podiatry office. Our product has the American Podiatric Medical Association Seal of Acceptance and we have partnered with thousands of podiatrists across the country to limit the risk of re-infection from contaminated shoes. Diabetes Foot Infection: Consequences & Culprits What Causes Smelly Feet?